In a paper published (open access) June 1 in the journal Cell, researchers report that they have cracked the code for facial identity in the primate brain. Instead, they found that rather than representing a specific identity, each face cell represents a specific axis within a multidimensional space, which they call the “face space.” These axes can combine in different ways to create every possible face. In other words, there is no “Jennifer Aniston” neuron. The clinching piece of evidence: the researchers could create a large set of faces that looked extremely different, but which all caused the cell to fire in exactly the same way. “This was completely shocking to us — we had always thought face cells were more complex. But it turns out each face cell is just measuring distance along a single axis of face space, and is blind to other features,” Tsao says. This research was supported by the National Institutes of Health, the Howard Hughes Medical Institute, the Tianqiao and Chrissy Chen Institute for Neuroscience at Caltech, and the Swartz Foundation. * The researchers started by creating a 50-dimensional space that could represent all faces. They assigned 25 dimensions to the shape–such as the distance between eyes or the width of the hairline–and 25 dimensions to nonshape-related appearance features, such as skin tone and texture. Using macaque monkeys as a model system, the researchers inserted electrodes into the brains that could record individual signals from single face cells within the face patches. They found that each face cell fired in proportion to the projection of a face onto a single axis in the 50-dimensional face space. 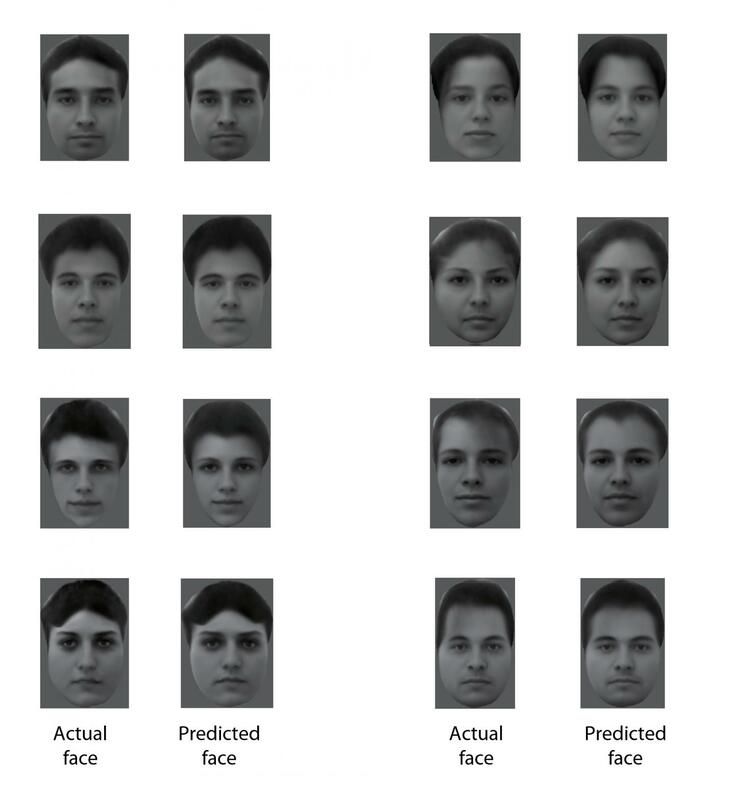 Knowing these axes, the researchers then developed an algorithm that could decode additional faces from neural responses. Primates recognize complex objects such as faces with remarkable speed and reliability. Here, we reveal the brain’s code for facial identity. Experiments in macaques demonstrate an extraordinarily simple transformation between faces and responses of cells in face patches. By formatting faces as points in a high-dimensional linear space, we discovered that each face cell’s firing rate is proportional to the projection of an incoming face stimulus onto a single axis in this space, allowing a face cell ensemble to encode the location of any face in the space. Using this code, we could precisely decode faces from neural population responses and predict neural firing rates to faces. Furthermore, this code disavows the long-standing assumption that face cells encode specific facial identities, confirmed by engineering faces with drastically different appearance that elicited identical responses in single face cells. Our work suggests that other objects could be encoded by analogous metric coordinate systems.